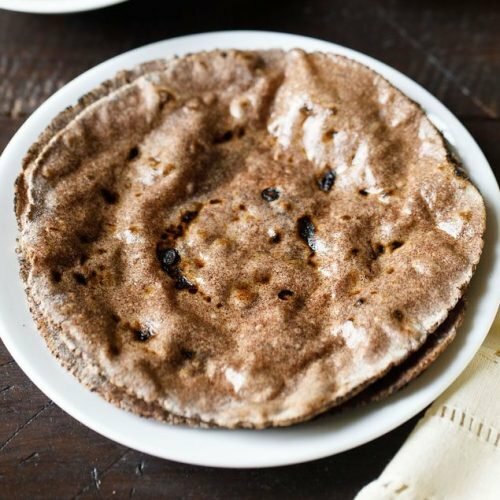 rustic and healthy ragi roti made with ragi aka finger millet flour and whole wheat flour. take 2 cups ragi flour and 1 cup atta in a parat or a large bowl. also add 1 teaspoon salt or add as required. add 1.5 cups hot boiling water. mix with a spoon. after mixing wait for a few minutes till heat is enough to handle. then begin to knead when the mixture is still hot. once you are able to form the dough, then keep on sprinkling warm water bit by bit and knead till you get a soft dough. the dough should be soft. cover and let dough rest for 20 minutes. then make medium sized balls from the dough. flatten the ball. sprinkle some whole wheat flour or ragi flour on the dough ball. turn on the gas stove and put the tawa to make it hot. the tawa has to be sufficiently hot to make soft rotis. while tawa is getting hot, start rolling the dough ball into a flat round circle. add more flour if required, so that while rolling the dough does not break. in case the dough starts sticking to the rolling pin (belan), then sprinkle some flour on the roti evenly and continue to roll it. place the ragi roti on the hot tawa. keep the flame to high. first roast one side. it should be less than half cooked or about one-fourth cooked. turn and cook the other side. this side should be a little bit more cooked than the first side. some brown spots should be visible. now hold the roti with tongs and keep the first side which was cooked, directly on fire. keep on moving roti with the tongs roasting the edges as well. the roti will start to puff. when the roti has puffed well, then turn and keep the other side on fire and roast ragi roti for some seconds. avoid burning the rotis and also don’t overdo the fire roasting as then these ragi rotis become dense. remove and place them in a roti basket/roti dabba or casserole. spread some ghee on the rotis. applying ghee or oil keep these rotis soft. ragi rotis made with this method is ideally served hot. if you cannot serve them hot, then you can keep them in a container that keeps food warm like a casserole or in a roti basket. make ragi rotis this way and stack them in the roti dabba if not serving straight away. serve ragi roti with any indian vegetable dish or dal of your choice.